Saucony Breakthru 4 are neutral performance running shoes. Again lot of changes to make Saucony Breakthru 4 a successful running shoe. The american brand has unveiled several innovative running shoes recently like Freedom ISO or its counterpart with pronation control Liberty ISO but seems unable to release a more conventional performance running shoe which can compete against category's top seller Adidas Adizero Boston 6. Anyway the Breakthru 4 keeps classic 8 mm drop and slightly reduces its weight to improve overall performance. Upper goes back to more traditional approach getting rid of internal straps that embraced midfoot and ended with eyelets from its predecessor Breakthru 3. So a multilayer mesh plenty of ventilation holes to provide great breathability covers most upper's surface leaving rear area with a more robust fabric which maintains everything in place for enhanced stability, a similar solution popular Kinvara 9 applies. As many other Saucony running shoes, Breakthru 4 features full-length EVERUN topsole for enhanced response over main foam, which is no longer SSL EVA but PWRFOAM, the same configuration used in its bigger sibling Ride 10 with apparently resulted in a successful outcome. Outsole has been updated as well to latest TRI-FLEX development based on three big blocks in the forefoot featuring a central groove each one for increased flexibility and smooth transition. 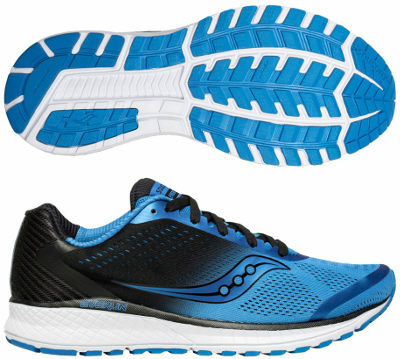 As Saucony fans can expect, some of few things that remain unchanged in Breakthru 4 are rubbers in outsole, so lightweight and flexible (IBR+) provides more grip in the forefoot to run faster with confidence and more durable carbon one (XT-900) is available in more exposed areas to increase durability.